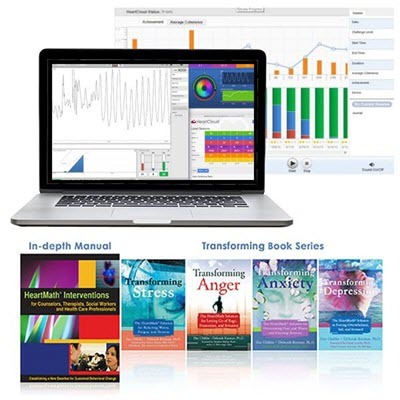 This training program is designed for doctors, nurses, psychologists, therapists, counselors, social workers, and other health professionals who want to add HeartMath techniques and emWave and Inner Balance technology to their practice. You can help your patients and client learn self-regulation and emotional management skills to help with stress, anxiety, and many other conditions. The training is taught in English and is available worldwide. It combines live and recorded webinars, video presentations, home study, and certification as a HeartMath Certified Practitioner. The HeartMath Inteventions Program is based on 18 years of best practices and results seen by practitioners who have used HeartMath technologies with thousands of students and adults. The in-depth training and education on the science of heart rate variability (HRV) and its relationship to stress, health and emotional self-regulation ensures practitioners achieve quick and sustainable results. Detailed information on the scientific underpinnings of the HeartMath System including the therapeutic implications of Heart Rate Variability measurement and assessment. Turns your computer into an heart-rhythm coherence monitor which shows clients how quickly emotions impact their physiology. Helps you teach clients a more efficient and automatic response to stressful emotions and facilitates their establishing coherence and a new physiological baseline. Effective for observing the clients current status of ANS function and level of depletion. *Note: emWave® Pro Plus ($499 if purchased separately) is included in this training. Partial scholarships may be available to practitioners who work in community organizations, educational institutions and other qualifying organizations. * Shipping charges for course materials are not included in the cost. All classes are 1 hr in length. Registration for each series closes 2 weeks prior to the Class 1. The program is available to health professionals. Licensure or certification as a health profession. Proof of employment in a qualified professional capacity..
* Refer to Letter of Agreement and HeartMath Interventions Program FAQs for additional information. 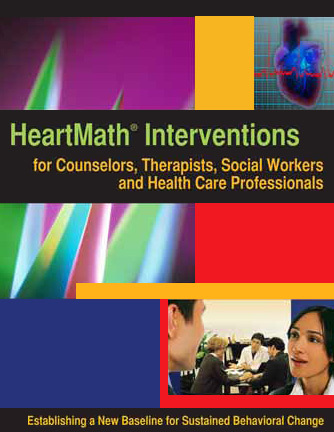 HeartMath Interventions Clinician Certification is rated 4.6 out of 5 by 85. Rated 4 out of 5 by Acr6524 from Good intro to the science and technology Sessions were a good introduction to the science behind HeartMath as well as the technology. I appreciated that the student-practitioners were encouraged and reminded to use this for ourselves even though we’re learning to use it in our helping professions. Rated 5 out of 5 by Eartha B from In-depth, well-designed, excellent support I thoroughly enjoyed this course. Our instructor was very knowledgeable, encouraging and happy to support our growth. A good number of excellent resources are available, both in the course materials and in the HMI professional's library. I feel good about the excellent support HMI offers, from first contact to follow-up support and am proud to support the Institute! Rated 5 out of 5 by vaham11 from Empowering Health! This information provides health & wellness empowerment! Truly a way forward in seeking a balance. Rated 5 out of 5 by Dianna from Valuable Tool HeartMath has greatly enhanced ability to help people understand how to reach therapeutic goals using their own emotional regulation. Rated 5 out of 5 by counselor from HeartMath Interventions This was very informative and useful training for counselors. Rated 5 out of 5 by Donna B from I am so grateful to learn Heart Math...It is Life My experience with the classes and the content has been a journey and will continue to be. I am so thankful to learn this life changing information and techniques. They have already changed me and my way of approaching each day with coherence and calm. I enjoy Dr. Culvert and his expertise on this subject. I will always be a student of Heart Math. Thank you so much for allof the support and information at my disposal. Rated 5 out of 5 by Eartha from Peace: Let It Begin With Me I enjoyed this course a great deal, beginning with making the commitment and a conscious effort to practice HeartMath Techniques and use the emWave Pro technology, on a daily basis. The Manual is very well done and a goldmine of information; and our instructor was highly knowledgeable and enjoyable to listen to and for participants to interact with. I've had an excellent experience from beginning to end, and am happy to recommend the HeartMath Interventions program for clinicians. Five stars! Rated 5 out of 5 by fiddler from Indispensible In a trauma practice clients relive the trauma/s. I was uncomfortable with the level of re-traumatization and was looking for a tool to help modulate the, in some cases, extreme emotional arousal such that when clients left the therapy office they would be coherent/present and could drive their cars without incident. HeartMath does just that. A client takes a baseline reading at the beginning of the session and at the end of the session a technique is introduced while taking a final reading. The next step is to keep the device connected to the client during the session, to give a visual of what the emotional arousal is doing to their nervous systems. After practicing the techniques, clients report having better relations at work, less intrusive thoughts/memories, and overall better quality of their present moments.